A week before Christmas my aunties and my grandmother would come to our house – we had the wooden oven – to make the traditional Christmas goodies: Kourabiedes and Melomakarona (Christmas cookies) and Christopsomo (Christmas bread). What a feast for us children! Our mothers were busy with the preparations and their latest news and we were out playing by the sea! 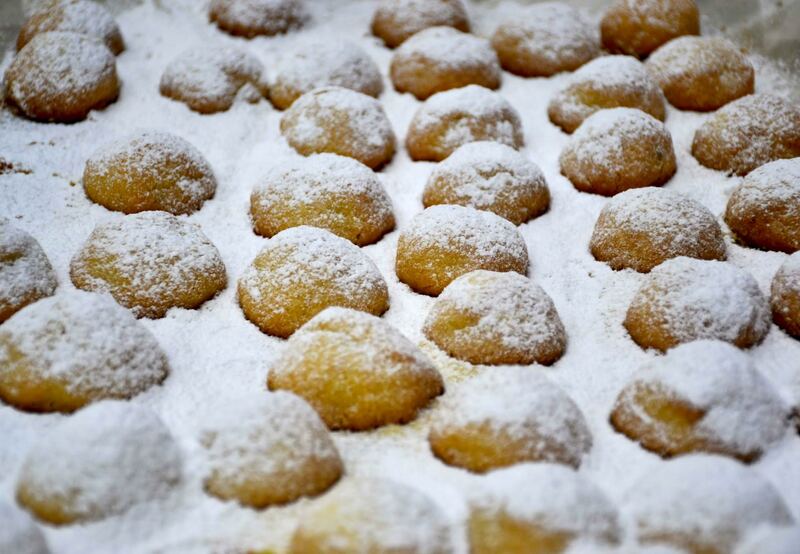 Butter is the most important ingredient for the kourabiedes. My mother would get fresh butter made of sheep’s milk from her mother in Trizina. It will be difficult for you to find this kind of butter, so try to use organic butter or butter with the highest quality possible. In Kavala in the north of Greece, they use butter from a local buffalo. Other places in Greece use goat’s butter. Up until last year I was using the recipe from my mother and I thought it made the best kourabiedes! However in the summer we had Theodora working for us at the Odyssey, who is a passionate cook. She showed us her grandmother’s recipe and I think it’s even better! (sorry mama). Prepare the dough, take a small amount of it and flatten it with your hands. Place a small piece of Turkish Delight in the middle and fold the dough to cover it. Shape it into a circle. Repeat this with all the dough and put the Kourabiedes on an ungreased baking sheet. Bake the little balls of dough until they are light (very light!) brown and let them cool on a rack. Let it snow in your kitchen! Dust the kourabiedes generously with the powdered sugar. In Greece it is a tradition to build a pyramid of kourabiedes, maybe you should try! Turkish Delight (a small box of 500 gr). With this amount you will have a few extra to serve on a nice plate! Cream the butter very well and gradually add the sugar. Beat until fluffy. Add the egg yolk, Mastiha (or brandy) and vanilla. Beat again until it’s very light and then stir in the almonds. Blend in the flour and baking powder mix to form a soft, smooth dough. Chill for 30 minutes or until the dough is ready to be handled easily. Preheat the oven to 160-170 degrees C or 325 degree F. Take a small amount of dough and flatten it with your hands. Place a small piece of Turkish Delight in the middle and fold the dough to cover it. Shape it into a circle. Continue shaping and place them on an ungreased baking sheet approx. 1 inch apart. Bake for 25-30 minutes or until they are light (very light!) brown. Cool on a rack. Dust generously with the powdered sugar.